NASA's Curiosity Rover snaps another great shot! 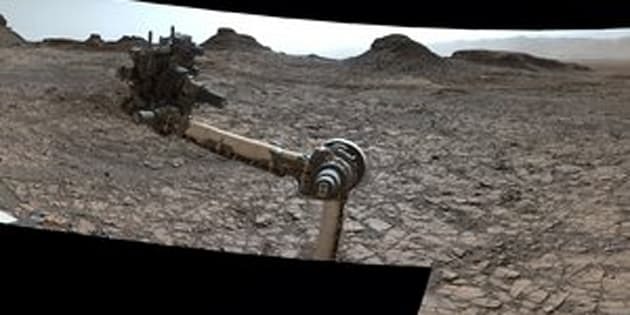 Parorama taken on the surface of Mars by NASA's Curiosity rover. It ain’t Earth, but it sure could’ve fooled us. A dramatic 360-degree panorama, released Friday by NASA’s Jet Propulsion Lab, shows the surface of Mars looking a lot like the southwestern U.S. The image, which was shot on Aug. 5 by the Mast Camera aboard the Curiosity rover, most notably highlights a formation known as the Murray Buttes on Mount Sharp, a peak that rises 18,000 feet over the floor of the valley in which it’s located. More than 130 individual pictures make up the stunning visual. All of them were snapped from the rover’s position during the afternoon of the mission’s 1,421st sol (Martian day), which was also the fourth anniversary of Curiosity’s landing on Mars. It’s hard to tell scale from a quick glance, but NASA says the dark mesa just left of Curiosity’s robotic arm is about 50 feet high and 300 feet from the rover’s position. You can also see an upper portion of Mount Sharp to the left of the mesa. Still curious about Curiosity? The video below explains what the rover has accomplished during its four-year (and counting) sojourn on the red planet.